Livingstone was, until 2012, the capital of the Southern Province of Zambia. Lying 10 km (6.2 mi) to the north of the Zambezi River, it is a tourism centre for the Victoria Falls and a border town with road and rail connections to Zimbabwe on the other side of the Victoria Falls. A historic British colonial city, its present population was estimated at 136,897 inhabitants at the 2010 census. 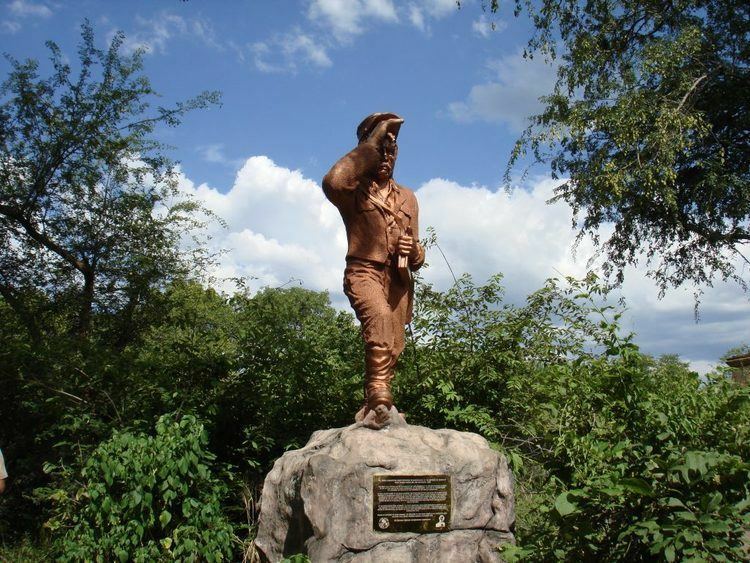 It is named after David Livingstone, the British explorer who was the first European to explore the area. Mukuni, 9.6 km (6.0 mi) to the south-east of present-day Livingstone, was the largest village in the area before Livingstone was founded. Its Baleya inhabitants, originally from the Rozwi culture in Zimbabwe, were conquered by Chief Mukuni who came from the Congo in the 18th century. Another group of Baleya under Chief Sekute lived near the river west of the town. The most numerous people in the area, though, were the Batoka under Chief Musokotwane based at Senkobo, 30 km (19 mi) north. These are southern Tonga people but are culturally and linguistically similar to the Baleya and grouped with them as the 'Tokaleya'. The Tokaleya paid tribute to the Lozi of Barotseland but in 1838 the Kololo, a Sotho tribe from South Africa displaced by Zulu wars, migrated north and conquered the Lozi. The Kololo placed chiefs of their subordinate Subiya people of Sesheke over the Tokaleya. In 1855 Scottish missionary traveller David Livingstone became the first European to be shown the Zambezi in the Livingstone vicinity and to see Victoria Falls when he was taken there by the Subiya/Kololo Chief Sekeletu. In the 1890s Cecil Rhodes' British South Africa Company established British rule north of the Zambezi and launched a wave of mineral prospecting and exploration of other natural resources such as timber, ivory and animal skins in the territory it called North-Western Rhodesia. The main crossing point of the Zambezi was above the falls at the Old Drift, by dugout canoe, later an iron boat propelled by eight Lozi paddlers, or a barge towed across with a steel cable. The Batoka Gorge and the deep valley and gorges of the middle Zambezi (now flooded by the Kariba Dam) meant there was no better crossing point between the Falls and Kariba Gorge, 483 km (300 mi) north-east. As the Old Drift crossing became more used, a British colonial settlement sprang up there and around 1897 it became the first municipality in the country and is sometimes referred to as 'Old Livingstone'. Proximity to mosquito breeding areas caused deaths from malaria, so after 1900 the Europeans moved to higher ground known as Constitution Hill or Sandbelt Post Office, and as that area grew into a town it was named Livingstone in honour of the explorer. In the mid-1890s Rhodesian Railways had reached Bulawayo in Southern Rhodesia spurring industrial development there, fuelled by the coal mines at Hwange just 110 km (68 mi) south-east of Mosi-oa-Tunya. The railway was extended to Hwange for the coal, but Rhodes' vision was to keep pushing north to extend the British Empire, and he would have built it to Cairo if he could. In 1904 the railway reached the Falls on the southern side and construction of the Victoria Falls Bridge started. Too impatient to wait for its completion, Rhodes had the line from Livingstone to Kalomo built and operations started some months in advance of the bridge using a single locomotive which was conveyed in pieces by temporary cableway across the gorge next to the bridge building site. With the new Bridge open in September 1905, Livingstone boomed. The British South Africa Company moved the capital of the territory there in 1907. In 1911 the company merged the territory with North-Eastern Rhodesia as Northern Rhodesia. Livingstone prospered from its position as a gateway to trade between north and south sides of the Zambezi, as well as from farming in the Southern Province and commercial timber production from forests to its north-west. A number of colonial buildings were erected which still stand. Although the capital was moved to Lusaka in 1935 to be closer to the economic heartland of the Copperbelt, industries based on timber, hides, tobacco, cotton (including textiles) and other agricultural products grew. A hydroelectric plant was built taking water from the Eastern Cataract of the Falls. The town of Victoria Falls in Southern Rhodesia had the tourist trade, but many supplies were bought from Livingstone. Of all the towns in Northern Rhodesia, colonial Livingstone took on the most British character. Surrounded by large numbers of African settlements, it had a strongly marked segregation which while not being officially enshrined as an apartheid policy, had similar practical effects. The north and western areas of the town and the town centre were reserved for the colonial government and white-owned businesses and associated residential areas, while African townships such as Maramba (named after the small Maramba River flowing nearby) were in the east and south and were inhabited by working servants, craftsman, tradesman, as well as large numbers of non-working black families suffering under welfare dependency. Asians and people of mixed race owned businesses in the middle, on the eastern side of the centre. As the British government began publicly discussing independence, and news of the large scale genocide of white colonials in nearby Belgian Congo was heard, many white residents feared abandonment by the British colonial government. Consequently, many began making moves to migrate south toward Southern Rhodesia or South Africa. When Northern Rhodesia obtained independence as Zambia, many more whites continued to leave. At the end of British rule in 1964, Africans were handed a country in which there were only 100 black college graduates, almost all in social sciences from the University of Fort Hare in South Africa. In 1968, a one party state had been established which seized most remaining non-black property, especially those of whites. Consequently, most of the remaining Northern Rhodesians left after an official policy of nationalisation in Zambia was announced. Some colonial civic buildings were destroyed and replaced with an African architecture, although Livingstone was used as a location for a 1950s Rhodesian town in the 1981 movie The Grass is Singing (based on the Doris Lessing novel of that name). . At the same time, a large infusion of cash from the British government to Zambia at independence was partially used in Livingstone. Livingstone suffered economic decline in the 1970s due in part to renationalisation of industries and in part to closure of the border with Rhodesia, first by the Zambian government and later by the Rhodesian authorities. In the last ten years, Livingstone has experienced a resurgence in tourism and has firmly become the destination of choice when visiting the Victoria Falls. Livingstone has enjoyed a slight influx of investment in the industry from modern hotel chains like Sun International, to some modern street strip mall centers and restaurants. Apart from tourism, the other hope on Livingstone's horizon is development stimulated by the Walvis Bay Corridor with the opening of the Katima Mulilo Bridge and completion of the Trans–Caprivi Highway 200 km (120 mi) east, which funnels more trade through the town. Livingstone has a hot semi-arid climate (Köppen: BSh) with hot and rainy wet seasons and very hot pre-wet seasons and mild dry seasons with large temperature differences between day and night. See the main article Transport in Zambia for more details. Harry Mwanga Nkumbula International Airport: domestic connections via Lusaka and a year-round international connection to Johannesburg. Rail (freight only) to Zimbabwe via Victoria Falls Bridge (weight restrictions apply). Zambia Railways passenger and freight services to Lusaka and the Copperbelt. Road to Zimbabwe via Victoria Falls Bridge (weight restrictions apply). Recently rehabilitated road to the Kazungula Ferry to link to Botswana, and to Sesheke to connect with the Katima Mulilo Bridge/Transcaprivi Highway as part of the Walvis Bay Corridor. Victoria Falls (Mosi-oa-Tunya) which is protected and served by the Mosi-oa-Tunya National Park on the city's south-western edge. Wildlife safaris (game drives) in the wildlife section of the Mosi-oa-Tunya National Park. Birdwatching in the Mosi-oa-Tunya National Park. Batoka Gorges below the Falls in the Mosi-oa-Tunya National Park. Zambezi River above the Falls including river cruises, sports fishing, kayaking. Victoria Falls Field Museum featuring geology and archaeology around the Falls. Flights over the Falls including helicopter and microlight flights. Livingstone Museum is devoted to archaeology, ethnography and history and contains a collection of memorabilia relating to David Livingstone. In front of the museum there is a statue to him, as well as to Czech ethnographer Emil Holub, erected in 2005. Maramba Cultural Museum featuring traditional dancing, singing, costumes. Mukuni Village with its annual Lwiindi Ceremony in July. North-Western Hotel — built 1909 by 'Mopane' Clarke (awaiting restoration). Saint Andrews Church — built 1910-11 in memory of David Livingstone and still in use. The High Court, Livingstone — built in 1910 (awaiting restoration). Old Government House, Livingstone — the main government office and governor's residence 1907-1935 when Livingstone was the capital of Barotziland-North-Western Rhodesia and Northern Rhodesia; (awaiting restoration). Maramba old people's home.A home for the aged who have no one to look after them. Government hostels, former Busiku guest house. Maramba SDA church, the first SDA church to be opened on the eastern part of Livingstone. Many more activities and attractions can be found at Livingstone Tourism Association's website.